April is filled with exciting events for the Toms River and Ocean County community! We look forward to you joining us for good food and fun! Are you a Bloody Mary aficionado? Come out on April 24 for our Bloody Mary Contest to benefit the local PBA. Ten of the area’s top bartenders converge at Tuscan Bistro Bar to compete to create the best Bloody Mary. Help us determine the fan favorite! Tickets for the event go on sale April 11th. Your $20.00 admission fee will include a Bloody Mary and a T-Shirt (while supplies last). Part of the proceeds will go directly to our local PBA. The contest begins a 12pm. You’ll probably want something tasty to eat while enjoying your Bloody Mary. In addition to our regular menu, Breakfast Pizzas will be available to order from 12-1pm. Sponsored by Tara D’Uva, Juice Plus Representative, the Bloody Mary Contest will be followed up by our Salad in a Jar Party. Bring your own mason jars, up to 5 16oz jars, and create your own Salad in a Jar from our complimentary salad bar. The Salad in a Jar Party is a great kick start to being your healthiest self this spring and summer. Along with all the food and fun, Tara is going to fill everyone in on just what Juice Plus is all about. The party starts at 1 pm on April 24, so grab your mason jars. Get a healthy head start this spring with 5 salads you hand crafted yourself and valuable information about Juice Plus. Tara will be happy to answer all your questions. Tuscan Bistro Bar’s Senior Social is one of our most popular monthly events. 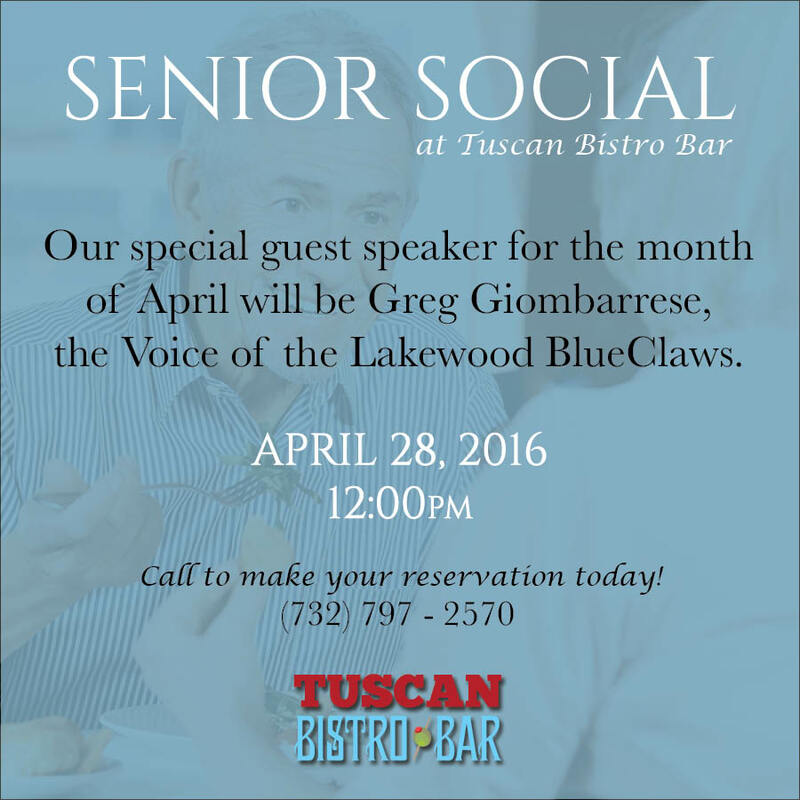 This month’s speaker is Greg Giombarrese, the voice of the Lakewood BlueClaws. Greg is the Senior Manager of Media and Public Relations for the BlueClaws Organization. He has been with the team for more than 7 years. No doubt, he will share some interesting stories and insights about the Single A minor league team. Admission for our Senior Social is $12.00 and includes a delicious buffet lunch. This month’s social takes place on April 28 at 12 pm. Register today! Even though it doesn’t take place until next month, don’t forget that Tuscan Bistro Bar and The BlueClaws are joining forces to raise awareness and funds for the ALS Foundation on May 25th at 6pm. The BlueClaw team members will be serving your meal with the assistance of our expert staff and Buster, the team’s mascot will be there. To raise funds for research to someday cure this disease, there will be a Silent Auction and a 50/50 raffle. The evening’s tips will also go to the ALS Foundation. Please join us for an evening of great food and family fun while supporting a good cause! There is always something going on at Tuscan Bistro Bar. We have Trivia on Tuesdays! Grab a group and come out for some friendly competition. In addition, there is all night Happy Hour in the bar and ½ price bottles of wine in the dining room. Wednesdays are BOGO Ribs! Bring a friend and each choose your favorite, Blackberry Brandy or Classic. Your ribs are served with one side and cornbread. BOGO Ribs are available all day and reservations are recommended. We have musical entertainment every month. If you missed DJ Chris Anthony or KatFish Lucy earlier this month, don’t despair. Ned Ryerson and The Groundhogs will be entertaining at Tuscan Bistro Bar on Saturday, April 23 beginning at 9 pm. Whatever events you choose, we look forward to seeing you!